Recently, I wrote a paper together with Masud Chaichian (see here) containing a mathematical proof of confinement of a non-Abelian gauge theory based on Kugo-Ojima criterion. This paper underwent an extended review by several colleagues well before its submission. One of them has been Taichiro Kugo, one of the discoverers of the confinement criterion, that helped a lot to improve the paper and clarify some points. Then, after a review round of about two months, the paper has been accepted in Physics Letters B, one of the most important journals in particle physics. This paper contains the exact beta function of a Yang-Mills theory. This confirms that confinement arises by the combination of the running coupling and the propagator. This idea was around in some papers in these latter years. It emerged as soon as people realized that the propagator by itself was not enough to grant confinement, after extended studies on the lattice. It is interesting to point out that confinement is rooted in the BRST invariance and asymptotic freedom. The Kugo-Ojima confinement criterion permits to close the argument in a rigorous way yielding the exact beta funtion of the theory. When a theory is too hard to solve people try to consider lower dimensional cases. This also happened for Yang-Mills theory. The four dimensional case is notoriously difficult to manage due to the large coupling and the three dimensional case has been treated both theoretically and by lattice computations. In this latter case, the ground state energy of the theory is known very precisely (see here). So, a sound theoretical approach from first principles should be able to get that number at the same level of precision. 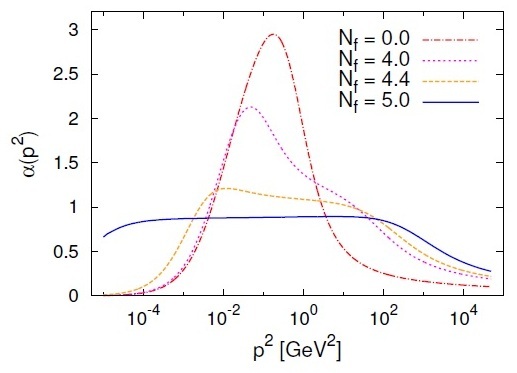 We know that this is the situation for Standard Model with respect to some experimental results but a pure Yang-Mills theory has not been seen in nature and we have to content ourselves with computer data. The reason is that a Yang-Mills theory is realized in nature just in interaction with other kind of fields being these scalars, fermions or vector-like. These results are strikingly good and the agreement is well below 1%. This in turn implies that the underlying theoretical derivation is sound. Besides, the approach proves to be successful both also in four dimensions (see here). My hope is that this means the beginning of the era of high precision theoretical computations in strong interactions. Yang-Mills theory paper gets published! Exact solutions of quantum field theories are very rare and, normally, refer to toy models and pathological cases. Quite recently, I put on arxiv a pair of papers presenting exact solutions both of the Higgs sector of the Standard Model and the Yang-Mills theory made just of gluons. The former appeared a few month ago (see here) while the latter has been accepted for publication a few days ago (see here). I have updated the latter just today and the accepted version will appear on arxiv on 2 January next year. What does it mean to solve exactly a quantum field theory? A quantum field theory is exactly solved when we know all its correlation functions. From them, thanks to LSZ reduction formula, we are able to compute whatever observable in principle being these cross sections or decay times. The shortest way to correlation functions are the Dyson-Schwinger equations. These equations form a set with the former equation depending on the higher order correlators and so, they are generally very difficult to solve. They were largely used in studies of Yang-Mills theory provided some truncation scheme is given or by numerical studies. Their exact solutions are generally not known and expected too difficult to find. The problem can be faced when some solutions to the classical equations of motion of a theory are known. In this way there is a possibility to treat the Dyson-Schwinger set. Anyhow, before to enter into their treatment, it should be emphasized that in literature the Dyson-Schwinger equations where managed just in one way: Using their integral form and expressing all the correlation functions by momenta. It was an original view by Carl Bender that opened up the way (see here). The idea is to write the Dyson-Schwinger equations into their differential form in the coordinate space. So, when you have exact solutions of the classical theory, a possibility opens up to treat also the quantum case! This shows unequivocally that a Yang-Mills theory can display a mass gap and an infinite spectrum of excitations. Of course, if nature would have chosen the particular ground state depicted by such classical solutions we would have made bingo. This is a possibility but the proof is strongly related to what is going on for the Higgs sector of the Standard Model that I solved exactly but without other matter interacting. If the decay rates of the Higgs particle should agree with our computations we will be on the right track also for Yang-Mills theory. Nature tends to repeat working mechanisms. I am back after the announcement by CERN of the restart of LHC. On May this year we will have also the first collisions. This is great news and we hope for the best and the best here is just the breaking of the Standard Model. The Higgs in the title is not Professor Higgs but rather the particle carrying his name. The question is a recurring one since the first hints of existence made their appearance at the LHC. The point I would like to make is that the equations of the theory are always solved perturbatively, even if exact solutions exist that provide a mass also if the theory is massless or has a mass term with a wrong sign (Higgs model). All you need is a finite self-interaction term in the equation. So, you will have bad times to recover such exact solutions with perturbation techniques and one keeps on living in the ignorance. If you would like to see the technicalities involved just take a cursory look at Dispersive Wiki. What is the point? The matter is rather simple. The classical theory has exact massive solutions for the potential in the form and this is a general result implying that a scalar self-interacting field gets always a mass (see here and here). Are we entitled to ignore this? Of course no. But today exact solutions have lost their charm and we can get along with them. For the quantum field theory side what could we say? The theory can be quantized starting with these solutions and I have shown that one gets in this way that these massive particles have higher excited states. These are not bound states (maybe could be correctly interpreted in string theory or in a proper technicolor formulation after bosonization) but rather internal degrees of freedom. It is always the same Higgs particle but with the capability to live in higher excited states. These states are very difficult to observe because higher excited states are also highly depressed and even more hard to see. In the first LHC run they could not be seen for sure. In a sense, it is like Higgs is alone but with the capability to get fatter and present himself in an infinite number of different ways. This is exactly the same for the formulation of the scalar field as originally proposed by Higgs, Englert, Brout, Kibble, Guralnik and Hagen. We just note that this formulation has the advantage to be exactly what one knows from second order phase transitions used by Anderson in his non-relativistic proposal of this same mechanism. The existence of these states appears inescapable whatever is your best choice for the quartic potential of the scalar field. It is interesting to note that this is also true for the Yang-Mills field theory. The classical equations of this theory display similar solutions that are massive (see here) and whatever is the way you develop your quantum filed theory with such solutions the mass gap is there. The theory entails the existence of massive excitations exactly as the scalar field does. This have been seen in lattice computations (see here). Can we ignore them? Of course no but exact solutions are not our best choice as said above even if we will have hard time to recover them with perturbation theory. Better to wait. Some years ago I proposed a set of solutions to the classical Yang-Mills equations displaying a massive behavior. For a massless theory this is somewhat unexpected. After a criticism by Terry Tao I had to admit that, for a generic gauge, such solutions are just asymptotic ones assuming the coupling runs to infinity (see here and here). Although my arguments on Yang-Mills theory were not changed by this, I have found such a conclusion somewhat unsatisfactory. The reason is that if you have classical solutions to Yang-Mills equations that display a mass gap, their quantization cannot change such a conclusion. Rather, one should eventually expect a superimposed quantum spectrum. But working with asymptotic classical solutions can make things somewhat involved. This forced me to choose the gauge to be always Lorenz because in such a case the solutions were exact. Besides, it is a great success for a physicist to find exact solutions to fundamental equations of physics as these yield an immediate idea of what is going on in a theory. Even in such case we would get a conclusive representation of the way the mass gap can form. Finally, after some years of struggle, I was able to get such a set of exact solutions to the classical Yang-Mills theory displaying a mass gap (see here). Such solutions confirm both the Tao’s argument that an all equal component solution for Yang-Mills equations cannot hold in any gauge and also my original argument that an all equal component solution holds, in a general case, only asymptotically with the coupling running to infinity. But classically, there exist solutions displaying a mass gap that arises from the nonlinearity of the equations of motion. The mass gap goes to zero as the coupling does. Translating this in the quantum realm is straightforward as I showed for the Lorenz (Landau) gauge. I hope all this will help to better elucidate all the physics around strong interactions. My efforts since 2005 went in that direction and are still going on. Yang-Mills theory has an infrared trivial fixed point. The theory is trivial exactly as the scalar field theory is. Due to this, gluon propagator is well-represented by a sum of weighted Yukawa propagators. The theory acquires a mass gap that is just the ground state of a tower of states with the spectrum of a harmonic oscillator. The reason why Yang-Mills theory is trivial and QCD is not in the infrared limit is the presence of quarks. Their existence moves the theory from being trivial to asymptotic safety. These results that I have got published on respectable journals become the reason for rejection of most of my successive papers from several referees notwithstanding there were no serious reasons motivating it. But this is routine in our activity. Indeed, what annoyed me a lot was a refeee’s report claiming that my work was incorrect because the last of my statement was incorrect: Quark existence is not a correct motivation to claim asymptotic safety, and so confinement, for QCD. Another offending point was the strong support my approach was giving to the idea of a decoupling solution as was emerging from lattice computations on extended volumes. There was a widespread idea that the gluon propagator should go to zero in a pure Yang-Mills theory to grant confinement and, if not so, an infrared non-trivial fixed point must exist. From this picture it is evident that there exists a critical number of quarks for which the theory becomes asymptotically safe and confining. So, quarks are critical to grant confinement and Yang-Mills theory can happily be trivial. The authors took great care about all the involved approximations as they solved Dyson-Schwinger equations as usual, this is always been their main tool, with a proper truncation. From the picture it is seen that if the number of flavours is below a threshold the theory is generally trivial, so also for the number of quarks being zero. Otherwise, a non-trivial infrared fixed point is reached granting confinement. Then, the gluon propagator is seen to move from a Yukawa form to a scaling form. This result is really exciting and moves us a significant step forward toward the understanding of confinement. By my side, I am happy that another one of my ideas gets such a substantial confirmation. The gluon propagator in 3 and 4 dimensions dos not go to zero with momenta but is just finite. In 3 dimensions has a maximum in the infrared reaching its finite value at 0 from below. No such maximum is seen in 4 dimensions. 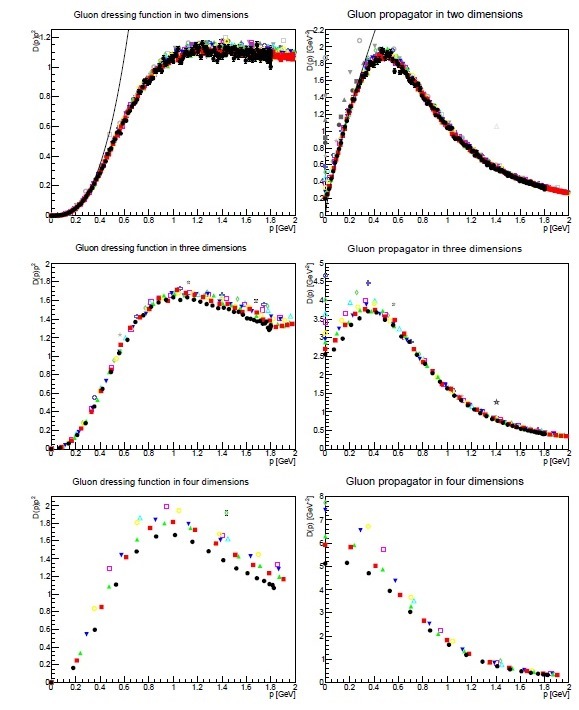 In 2 dimensions the gluon propagator goes to zero with momenta. The ghost propagator behaves like the one of a free massless particle as the momenta are lowered. This is the dominant behavior in 3 and 4 dimensions. In 2 dimensions the ghost propagator is enhanced and goes to infinity faster than in 3 and 4 dimensions. 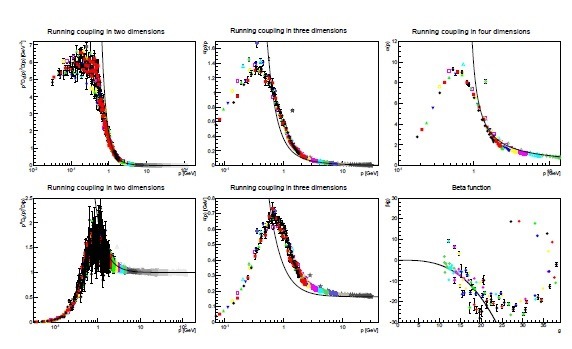 The running coupling in 3 and 4 dimensions is seen to reach zero as the momenta go to zero, reach a maximum at intermediate energies and goes asymptotically to 0 as momenta go to infinity (asymptotic freedom). There is some concern for people about the running coupling. There is a recurring prejudice in Yang-Mills theory, without any support both theoretical or experimental, that the theory should be not trivial in the infrared. So, the running coupling should not go to zero lowering momenta but reach a finite non-zero value. Of course, a pure Yang-Mills theory in nature does not exist and it is very difficult to get an understanding here. But, in 2 and 3 dimensions, the point is that the gluon propagator is very similar to a free one, the ghost propagator is certainly a free one and then, using the duck test: If it looks like a duck, swims like a duck, and quacks like a duck, then it probably is a duck, the theory is really trivial also in the infrared limit. Currently, there are two people in the World that have recognized a duck here: Axel Weber (see here and here) using renormalization group and me (see here, here and here). Now, claiming to see a duck where all others are pretending to tell a dinosaur does not make you the most popular guy in the district. But so it goes. These lattice computations are an important cornerstone in the search for the behavior of a Yang-Mills theory. Whoever aims to present to the World his petty theory for the solution of the Millennium prize must comply with these results showing that his theory is able to reproduce them. Otherwise what he has is just rubbish. What appears in the sight is also the proof of existence of the theory. Having two trivial fixed points, the theory is Gaussian in these limits exactly as the scalar field theory. A Gaussian theory is the simplest example we know of a quantum field theory that is proven to exist. Could one recover the missing part between the two trivial fixed points as also happens for the scalar theory? In the end, it is possible that a Yang-Mills theory is just the vectorial counterpart of the well-known scalar field, the workhorse of all the scholars in quantum field theory.